Thimbelina: Some people think we're Mad! I was lucky enough to be invited to join a friend (Paula) for a day of sewing yesterday, so we set to work at 9am...... and only stopped for Morning Tea, Lunch, Afternoon Tea, Dinner and Dessert...... Hmmm, maybe this is why it took so long to complete our project. Paula certainly looked after me! 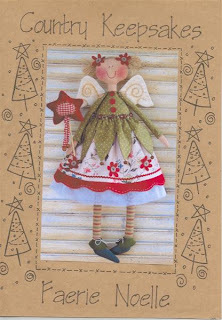 The plan was to Complete "Faerie Noelle", a gorgeous doll by Annie Smith of Country Keepsakes. Paula and I found the pattern back in August at our favourtie patchwork shop, The Home Patch on our way back from Sydney but hadn't been able to get together to make her until now. As you can see, Paula's is almost finished but mine still had a long way to go! After a few more hours sewing today my Faerie is complete and i think you'll agree she was worth the effort.............Think i'll name her Ruby! Your faerie is gorgeous, the attention to detail is magnificent. PS I will find out the McCalls pattern number for the bag (on our blog) tomorrow at work - I can't remember it.